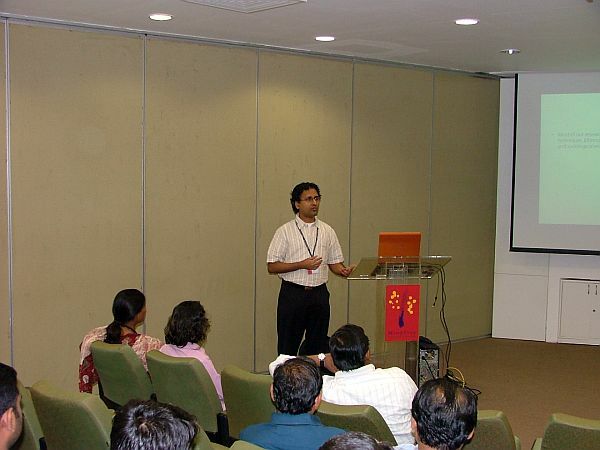 Was invited for a talk at MindTree, at their fancy “Global Village” campus in Bangalore, to talk about “Understanding Your Users“. Heavily loaded topic, of course. I decided to focus on 1 possible way of understanding users — using photo documentation techniques to uncover unmet & unarticulated needs. Walked through some examples of photo documentation based user research, using a recent informal study we conducted on the topic, ‘Car Storage Behaviour & Needs’. And, at the end, I also shared some “best practices” from my personal experience of having used this technique over the years. The audience consisted of people from varied disciplines – Engineering, User Experience/Usability, Product Management and Business Analysts…so, decided to keep the content relevant for audiences that are completely new to user research, as well as those who have basic awareness and minimal practical experience in field techniques. Interestingly, the crowd was very enthusiastic and inquisitive. Unlike similar sessions I’ve conducted before, the audience here warmed up very quickly and were full of questions in the very first few minutes. Was quite impressed with the level of enthusiasm and “aliveness” in the group. It made the whole effort very fulfilling! It’s time to start planning for people and not vehicles. Accessibility and not mobility should be the primary concern of the planners and government. Here’s a paper that Sudhir Gota & Prashant Mutalik have published on a related topic: Congestion to Demotorisation – A paradigm shift for Bangalore (PDF). Times of India‘s now started a new initiative (I’m guessing, encouraged by the success of the ‘Lead India’ initiative): ‘Unlock Bangalore – Let’s put the bang back in Bangalore‘. Why does Delhi have such wide roads? Further clarifying that theme, what is also widely accepted in India is the general “North Indian” and “South Indian” cultural divide (over the recent years, these have been redefined as the West-of-Kanpur and East-of-Kanpur divide). While there are several generalizations & pre-conceived notions about these two categories, what I’m referring to specifically is the perception of North Indians (those from Delhi, even more so) being “born-for-business”, people who show-off their wealth, “Live Life King Size” attitude. In other words — an orientation towards Abundance. Whereas, most South Indians (like me) have been brought up & constantly reminded about how we aren’t “cut for business”…we are the “salaried class”. A majority of our earnings MUST go into savings (to be used only at the time of retirement). Not to show-off one’s wealth. If you got a good job, don’t tell your neighbours until you actually complete your first full week at the new job! And so on. In other words — an orientation towards Scarcity. So, is it a coincidence that Delhi has the widest of roads and cities like Bangalore, Hyderabad and Chennai are suffering with narrow roads that are getting narrower, by the day? Also, is it a coincidence that Delhi/Gurgaon seem to have the biggest (really BIG) malls in the country? But, before that, a random observation during tea-break: Majority of the glasses that were used for drinking water, had around 20% of drinking water remaining in each of the glasses (sorry, wasn’t carrying my camera with me that day)! On the sustainability side, that’s around 20% of the drinking water that the five-star hotel buys going to a waste. And on the business side, the hotel is spending 20% more than they should be! Thankfully it wasn’t a powerpoint-presentation oriented event. It was an informal, open discussion facilitated by Vinita Bali. The topics that were discussed ranged from…predictable questions like, why she wrote the book, “We’re like that only!”…to interesting debates around…do businesses (especially entrepreneurs, given the fact it was a TiE event) really need to understand what their consumers’ needs are before going-to-market (this question did become a strong point of discussion among several in the audience)…to how do you know whether “that” is really the consumer’s need…to how one should spend time observing consumers at the point-of-sale/usage…to whether Reliance has got their retail business model correct or not (? ), etc. Scarcity & Abundance: I forget whether it was Vinita or Rama who made a very subtle, yet powerful & interesting point about how Indians are fundamentally oriented towards (or come from) scarcity rather than abundance. The context to this discussion was around the need for competition in the market, without which a business can pretty much do whatever it wishes (without taking into account consumers’ needs) and many times, get away with it. Vinita/Rama made the point that Indians have traditionally been shy of competition because there is a tendency to believe that, if there is competition, then one’s share of the pie is at stake. And that comes from the cultural background where Indians are so oriented towards scarcity rather than abundance…meaning, there’s this nagging worry/feeling that…what’s there, isn’t enough for everyone. Do businesses really need to understand consumer’s needs: A question was put forth about why businesses don’t want to, don’t like to spend too much time/effort/money on understanding the consumer’s needs. Several people had varied (also, weird) responses to that. Most of the folks who run businesses are usually the left-brain-thinking, logic-oriented folks. That doesn’t mean they don’t use their right-side at all…it’s probably relatively underutilized when it comes to making business decisions. And, why that’s significant is…understanding & decoding consumer’s needs, I think, requires a considerable amount of right-brain-thinking (in addition to the left-brain as well)….which they would much rather not deal with, because it seems to be so “hard to get”. And that’s probably why the general attitude towards end-user research has been of “Let’s-do-it-when-we-have-the-time-and-money”. Thankfully, not all clients think that way and people like me do end up putting our right-brain-thinking to good use. The other side of the coin: Researchers haven’t done a good (enough) job of translating research findings into tangible/measurable business recommendations or solutions. World-over, there seems to be (in my experience) an innate skepticism that research just ends up in a report that one files away, hardly ever to use one’s business decisions. So, researchers need to start talking business and the language of business to be able to really deliver the value that research often promises. While making a point during the discussion, one of the women in the audience talked about a conversation she once had with the store manager of one of the large (departmental/lifestyle) stores in Bangalore. The store manager said that only 40% of the store was allocated to women’s products and almost 60% was for men! The logic being that, women don’t actually buy as much as they spend so much time at the store!!! On a related note…and this I don’t recall so clearly…there was also a point about how some (traditional) business practices & approaches are so different in different parts of the world. In India, the conventional approach to pricing coffee would be to charge more for coffee with sugar (‘coz you’re having to spend on more sugar). But in the west, the practice is to charge more for diet drinks! Unlike most other TiE events (in Bangalore) that I’ve attended, this seemed to have the least participation from the techie crowd. There seemed to be several CEOs and heads of small-medium-enterprises in the crowd. Does it indicate the lack of interest among the techies about creating user-centered products & services? I guess that’s too harsh a conclusion to draw, but this phenomena didn’t seem like something to not make note of. The discussion (especially between the audience and the panelists) kept going back to the unresolved issue about connectivity to the new Bangalore airport that’s coming up in March 2008. One had to be there to experience the irritation, anger, frustration and complete resignation about the state of (infrastructure) affairs, surrounding the connectivity to the new airport. Of course, Rama did touch upon the fact that there are people who actually get to benefit from such poor connectivity or infrastructure, the cellphone companies to start with. If you aren’t getting to the airport on time or are even avoiding the travel, chances are you’re using the good ol’ phone to communicate with your business associates or your near & dear ones! Interesting. Rama Bijapurkar, has of course been in the news recently for her book, “We’re like that only” (interestingly, I read somewhere that the title of the book outside India is different…and that did seem like a wise move, considering those not from India wouldn’t get the concept of “We’re like that only!”). I bought Rama’s book a month ago but haven’t got around to reading it yet. Given we’re in a similar profession of understanding consumers’ needs in India, I’m really looking forward to this event. After the huge success of BarCamps in Bangalore, now it’s the turn of ‘Innovation Camps’. Interesting idea. Looking forward to an ‘unconference’ concept being extended to Innovation. Sustainable urban transport and urban mobility initiatives have always interested me. Thanks to a good friend who works at EMBARQ, and people like Ashwin Mahesh (who’s got a wealth of knowledge & experience in this domain), I’ve had the opportunity to learn more about it over the last year or so. But, an interesting conversation with a friend led to an idea that I feel holds a lot of possibilities in the context of urban mobility. A good friend took up a job recently at Idea Product Design (interesting company, by the way, do check them out) in Ahmedabad and happened to mention that the work hours are from 6.30am to 3pm or so! Obviously, my first reaction was absolute shock! Thankfully, better sense prevailed. And before I knew it, I was actually sold on the idea. To the extent that we’ve now changed our office hours (on a “trial” period to start with). We now start our day at 7am and are done by 4pm! Getting done early in the day and still having several hours left in the day, was one of the key motivators for all of us to try this out. But it’s also the urban mobility angle that’s been of interest for me personally. Though I’ve heard about similar initiatives by some corporates in Bangalore to beat traffic, for some reason, I wasn’t sold on the idea earlier. But I can now see HUGE value from being able to work during these early hours…not just to beat traffic, but being able to do so much more in a day, outside of work. I can’t wait to make this a habit, and to have some of the large corporates in the city to change timings as well. Imagine the number of the dreaded Qualis-cabs, corporate buses and private cars/bikes that would go off-the-road during the regular hours. Would love to hear your thoughts on this one (especially those in Bangalore). Car Free Day in Bandra (Mumbai city). Love the idea and the way they’ve “marketed” the concept using well-designed posters and social networking sites like Facebook. Nice. I’m now thinking of a similar initiative to have companies shift their work hours! An interesting blog by EMBARQ. At last, here’s a research preview (.PPS file | 2MB) of something we’ve been working on lately. In the spirit of ‘open source’, we are keen on sharing some of the work we do (with commissioned research, we don’t have that luxury of course). The idea is to create a dialogue, share ideas, thoughts among fellow practitioners in the research space, and with non-researchers from any discipline/background. In addition to commissioned research projects, we, at Onward, also conduct on-going research across a variety of topics that may impact Technology, Mobile and Retail industries in emerging markets like India. This presentation is a preview of a study that we are currently engaged in. The study is aimed at identifying the usage of mobile phones among the ‘Bottom of the Pyramid’ (BoP) users, especially those who use mobile phones as a way to sustain/grow their livelihood. We intend to document the users’ key behaviour patterns, trends and needs with respect to communication devices. We would love to hear your thoughts/feedback/questions/comments. Your inputs will be really useful as we continue to dive deeper into this topic.